I was constantly checking the site for this to go live and wondering how many people beat me to the list??? It's been a long while since I did the step-up program, but I don't recall getting a number in line......? You are placed in an internal queue and once you are next in line you will be notified via email. So it is a mystery! Are you EST? What exact time do you recall getting to the page that said you are now in que? I can confirm that at 11:13AM EASTERN TIME it was NOT YET ON THE LIST so I went back to bed when I go up an hour later it was available. I remember in the past everyone would get a number so people know how far in line they were. Not sure if anything has changed since. Yep, it changed. People thought they were getting shorted because they would show low numbers and others were posting that they had just got their step up. They probably didn’t account for the time where people waited to post or missed the email initially and had 72 hours to complete their step up after the email. Must of been at 12:16 EST, Last week when I thought the TI would list at 12 noon i kept checking at like 12:15pm the Non TI edition appeared. So I figured it would be the same this week, and sure enough it was. So to confirm your saying I was within the first 4 minutes on the list?? So as soon as I started a step-up, received a mail with the step-up ID, I'm on the list? I have nothing else to do - only wait for step 2? whats your guess before or after Black Friday for in our hands? 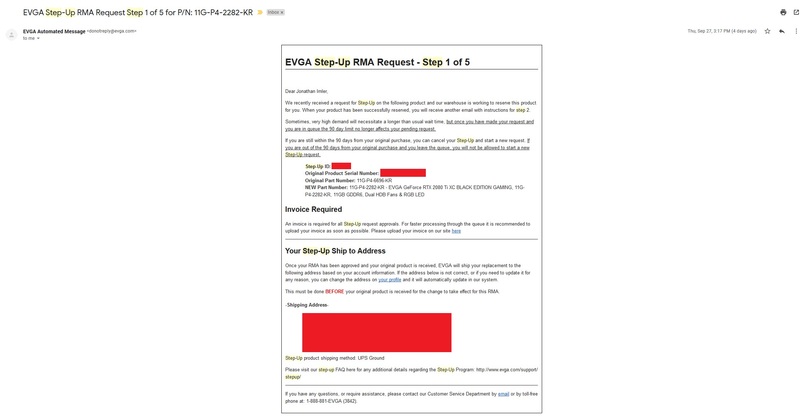 My E-Mail for Step-Up from EVGA was received at 11:18 Central US, which was less than 1 minute after the 2080 Ti was released to the Step-Up program. Someone above was saying that comparing step-up IDs is pointless since they are randomized, so I guess listing part of my step-up ID wouldn't help. I have two step-up's running - I got a 6-digit and a 7-digit ID. So it makes no sense to compare the IDs. Mine is a 7 digit number aswell was hoping we could figure out more information but I guess its just a waiting game now. I got a 7 digit. Submitted my step on the 27th at 3:17pm central time. Mine was only delayed due to technical issues. My Rig can do EpicFLOPs, Can yours? then you mean the 2080, since the 2080 Ti step up started on September 29th. EDIT ups 27th, right. then you mean the 2080, since the 2080 Ti step up started on September 29th. @Warboy I havent recieved that email should I be concerned? I do however see myself ''In Queue'' on the product page showing the correct card. Hmm, I would reach out to EVGA, but if you see the product page, I wouldn't be too worried about it. It's just weird not seeing a position in queue. For this card. Will the upcoming (may be or may not be) price increase on the GPU cards, Will it affect my Step-up price or i'm already locked with today's price? has anyone got past the In Queue step yet for their card? normal preorders are not getting their 2080 Tis for weeks and after they all got their 2080 Tis and it is available for normal customers, the queue gets processed. Until November I don´t think something can happen. I can't see step ups being fulfilled for at least a month or two what with there being such a shortage of cards for people paying full price... In all honesty I'd be happy getting my step up this side of Christmas. I'd be happy to get mine in March, not really in a rush.